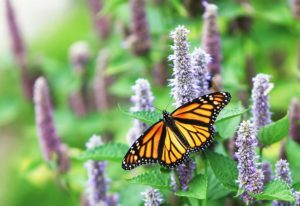 One of the surest ways to see fall-migrating Monarch butterflies is to plant flowers that attract them. Monarchs will drop from the sky for the nectar they need for energy during fall migrations. Monarch (Danaus plexippus) on Lantana (Lantana camara). Click Here or on the photo for Lantana seeds. Photo courtesy Tiago J. G. Fernandes. Used with permission. 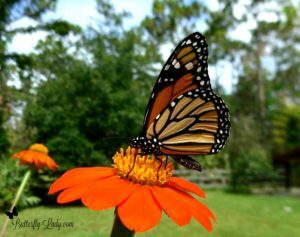 Monarchs will search for nectar plants the entire time they are traveling to their winter roosting sites in Mexico. 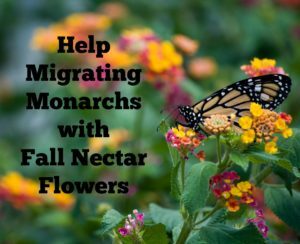 Gardens can provide a place for the migrating Monarchs so they can refuel and continue their journey. 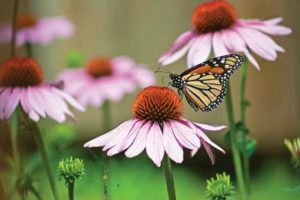 Help Monarchs by planting flowers that bloom late into the fall such as the flowers listed below. Asters (Aster spp.) 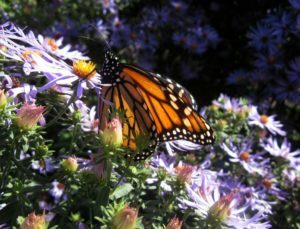 are a favorite of Monarchs in the fall, particularly the New England Aster (Symphyotrichum novae-angliae). Other asters include Smooth Aster (Symphyotrichum laeve), Aromatic Aster (S. oblongifolium), and Calico Aster (S. lateriflorum). Monarch nectaring on New England Aster (Symphyotrichum novae-angliae). Click Here or on the photo for New England Aster seeds. Sunflowers (Helianthus spp. 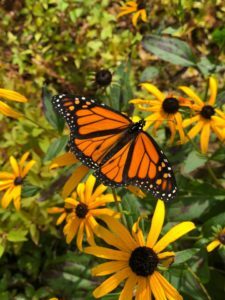 ), including Mexican Sunflower (Tithonia rotundifolia) and Swamp Sunflowers (Helianthus angustifolius) are late bloomers and provide wonderful nutrition for migrating Monarchs. Mexican Sunflower (Tithonia rotundifolia). 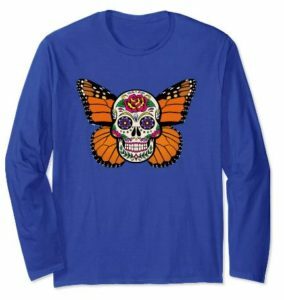 Click Here or on the photo for Mexican Sunflower seeds in orange, red, and yellow. Male Monarch on Swamp Sunflower (Helianthus angustifolius). Click Here or on the photo for Swamp Sunflower seeds. Photo courtesy LuGene Peterson. Used with permission. Many Lantanas are still blooming. 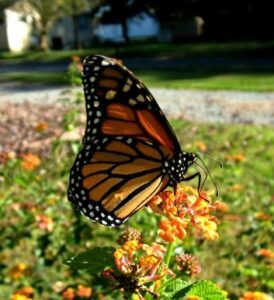 I had several Monarchs stop in late October in my North Carolina, USA, garden to sip the nectar from ‘Miss Huff’ Lantana (Lantana camara ‘Miss Huff’). ‘Miss Huff’ Lantana. Click Here or on the photo for ‘Miss Huff’ Lantana seeds. Goldenrod (Solidago spp.) is a wonderful fall blooming perennial and is one of the major nectar sources for the Monarchs’ trip back to Mexico. Click Here for Goldenrod seeds. The brilliant purple-crimson bloom of Ironweed (Vernonia fasciculata) is very attractive to Monarchs. 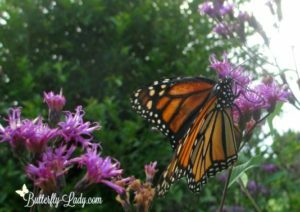 See some spectacular photos of Monarchs on Ironweed at the Flower Hill Farm Retreat. Monarch sampling Giant Ironweed. Click Here or on the photo for Ironweed seeds. Monarch butterfly goes to work on a Purple Coneflower in the garden. Click Here or on the photo for Purple Coneflower seeds. Autumn Joy Stonecrop (Sedum ‘Herbstfreude’) burst into bloom in fall. If left standing, they provide winter interest and food for birds. 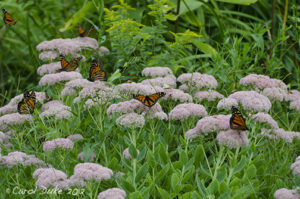 Migrating Monarchs stop by the Flower Hill Farm Retreat to feed on the blooms on ‘Autumn Joy’ Sedum. Click Here or on the photo for ‘Autumn Joy’ Sedum seeds. Photo courtesy Carol Ann Duke. Used with permission. 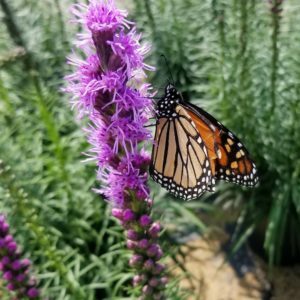 Liatris spicata, commonly called Blazing Star or Gay Feather is a native perennial that makes a wonderful pitstop for migrating Monarchs. Blazing Star (Liatris spicata). Click Here or on the photo for Blazing Star seeds. Anise Hyssop (Agastache foeniculum), also known as Giant Hyssop and Lavender Hyssop is a native perennial. Anise Hyssop (Agastache foeniculum). Click Here or on the photo for Anise Hyssop seeds. 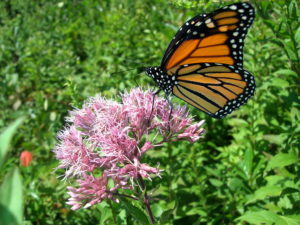 The Monarchs flock to the Joe Pye Weed (Eupatorium purpureum). Joe Pye Weed (Eupatorium purpureum). Click Here on on the photo for Joe Pye Weed seeds. 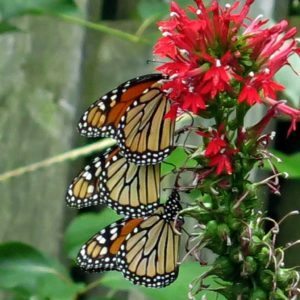 The red blooms of Cardinal Flower (Lobelia cardinalis) not only attract migrating Monarchs but also migrating hummingbirds.